Stars like the sun puff up and become red giants towards the end of their lives. 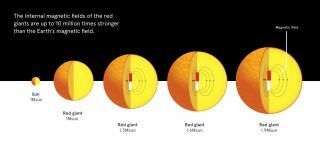 The red giants ('old' suns) of the same mass as the sun do not show strong magnetic fields in their interior, but for stars slightly more massive, up to 60 percent host strong magnetic fields. KISSIMMEE, Fla. — Many dying stars just a little bit more massive than the sun have superpowerful magnetic fields hidden away inside that likely play an important role in how such stars change over time, scientists say. The stellar findings, unveiled here at the 227th Meeting of the American Astronomy Society (AAS), identified strong magnetic fields near the cores of stars in the final stages of their lifecycle. And those intense magnetic forces are much more common than previously thought, the researchers found. "Magnetic fields have been neglected in [the study of] stellar evolution for a long time — now we see that they're common, and they can be very strong and can have a very important influence on stellar evolution," he added. The researchers used data from the orbiting Kepler Space Telescope to investigate thousands of red-giant stars— the stage of stellar evolution where stars like the sun begin fusing helium into carbon and balloon out into a much larger, cooler state. To look inside, they used a technique called asteroseismology: examining how sound waves ricochet around inside the star to determine its internal shape. Similar techniques can reveal the interiors of our own sun or even large planets with rings. That "ringing" causes subtle changes in brightness picked up by Kepler, and the researchers saw that for many of the stars, certain frequencies were suppressed as they passed through the star — indicating a strong magnetic field. Red-giant stars just slightly more massive than the sun hide strong magnetic fields in their cores because of the way convection operates. They found that red-giant stars as small as 1.1 times the sun's size could harbor the powerful magnetic fields, and that they became more likely the larger the star was — roughly half of stars 1.5 times the size of the sun or greater had the strong fields, Fuller said at the meeting session. The field is likely a remnant of an earlier stage of the stars' evolution, when those stars had strong flows of material within their cores that could have generated such a field. Stars the sun's size lack that internal movement, so those stars would have never had that magnetic power. "It looks like this effect, which had only been theoretically speculated about, is actually very, very common inside of slightly more massive stars than the sun," Fuller said. As they learn to detect the fields in the cores of different types of stars, he added, they can incorporate what they see into models of stars' interiors. "We've known for a very long time that magnetic fields can have a profound influence on the way stars live, the way they evolve and the way they die, but we've had very, very few observational constraints about [the kinds of magnetic fields] actually present inside the center regions or the cores of stars," Fuller said. "Now, we can start to learn about these magnetic fields using asteroseismology." The new work is detailed online in the Jan. 4 edition of the journal Nature.